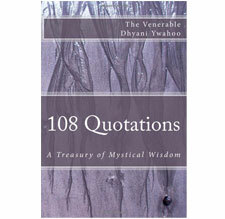 A gathering of insights from her many teachings from around the world, 108 Quotations: A Treasury of Mystical Wisdom offers profound wisdom into a way of life filled with grace and the healing energies of wise perception. Learning Cherokee Ways: The Ywahoo Path is a gathering of ancient wisdoms from the Ywahoo tradition and is a sacred passing of teachings that until now have been kept hidden. A moving journey through time, the text explores the Ywahoo experience of worlds, both seen and unseen, and the universes that surround us. Through stories, personal reminiscences, and conversations handed down through the generations, Learning Cherokee Ways: The Ywahoo Path resonates in our past, present, and future. 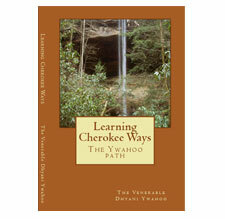 A remarkable worldview as well as a hands-on primer, Learning Cherokee Ways: The Ywahoo Path offers practices, meditations, and enhancement exercises that guide the reader and serves as a universal blessing for all beings. 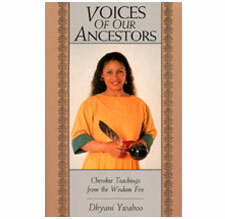 Voices of Our Ancestors teaches practical ways of transforming obstacles to happiness and good relationships, fulfilling one’s life purpose, manifesting peace and abundance, and renewing the planet. It includes meditations; healing rituals; instructions for working with crystals; and teachings on how to practice generosity and harmony. (SOLD OUT) Please contact us to see when supplies will be back in stock. The Crystal Teachings reveals the sacred crystal practices of the Green Mountain Ani Yun Wiwa lineage. Each volume includes a crystal energized by Venerable. In the wisdom teaching, 2012 & Beyond, the Venerable Dhyani Ywahoo offers practical guidance and insight into the powerful transition occurring on December 21, 2012. As a new cycle begins, 2012 & Beyond explores the seeds we are all planting with our thoughts, words, and actions. What choices will we make? Where will we place our attention? What changes will occur? 2012 & Beyond offers profound and positive ways we can place our attention on the future we wish to manifest. 2012 and Beyond is available in two formats: you can either purchase a CD plus a booklet of the text that will be mailed to you or a digital download and a downloadable PDF. CD/Booklet(SOLD OUT) Please contact us to see when supplies will be back in stock.